Cornell Tech today celebrated the official opening of its campus on Roosevelt Island with a dedication event attended by New York Governor Andrew Cuomo, New York City Mayor Bill de Blasio, former Mayor Mike Bloomberg, Cornell University President Martha Pollack, Technion President Peretz Lavie and Cornell Tech Dean Daniel Huttenlocher. Cornell Tech is the first campus ever built for the digital age, bringing together academia and industry to create pioneering leaders and transformational new research, products, companies and social ventures. Today marks the opening of the first phase of the Roosevelt Island campus, which features some of the most environmentally friendly and energy-efficient buildings in the world. In 2011, Cornell Tech was named the winner of Mayor Mike Bloomberg’s Administration’s visionary Applied Sciences Competition, designed with the goal of diversifying the economy and creating a national hub for tech. The project, managed by the City’s Economic Development Corporation, has been carried forward by the de Blasio administration, with the campus breaking ground in 2015. The City estimated in 2011 that the new campus would generate up to 8,000 permanent jobs, hundreds of spin-off companies and more than $23 billion in economic activity over a period of 35 years. The campus is built on 12 acres of City land. “Thanks to our investments to foster key industries, create good-paying jobs, and attract top talent, New York is the center of the world for finance, advertising, media, the arts and international commerce, but we are still building our reputation as an internationally-recognized hub of cutting-edge science and technology. By harnessing the engineering expertise of Cornell and the entrepreneurial spirit of Technion, Cornell Tech’s new campus will strengthen New York’s future competitiveness and produce innovations that will change the world,” said Governor Andrew Cuomo. “As we work to keep New York City a leader in the 21st Century economy, we celebrate the opening of the Cornell Tech campus and the opportunities it opens up for our city and our people. I am proud to welcome our newest leading educational institution, which will become a tremendous catalyst for our tech sector. We won’t stop here. Through Computer Science for All, the Tech Talent Pipeline and the new Union Square Tech Hub, we are building on the progress Mayor Bloomberg set in motion, and helping more New Yorkers become a part of this extraordinary success story,” said Mayor Bill de Blasio. “Cornell Tech is an investment in the future of New York City — a future that belongs to the generations to come, and the students here will help build it. Technological innovation played a central role in New York City becoming a global economic capital – and it must continue to play a central role for New York to remain a global economic capital. The companies and innovations spawned by Cornell Tech graduates will generate jobs for people across the economic spectrum and help our city compete with tech centers around the world, from Silicon Valley to Seoul,” said Mike Bloomberg. “Cornell Tech will create the leaders of tomorrow, bringing the brightest minds in the field of technology to Roosevelt Island. The digital age has not only improved the efficiency and productivity at the workplace, but created competitive high-paying salaries and stable jobs that keep overall unemployment rates lower. Cornell Tech is ahead of the curve by providing academic programs and training that will make this a world-renowned institution,” said Assembly Member Rebecca A. Seawright. “The new Cornell Tech campus is a wonderful addition to Roosevelt Island and will continue to propel New York City as a leader in technology and innovation. Not only will this state of the art campus generate thousands of permanent jobs and billions of dollars in economic activity over the next 30 years, but is also environmentally friendly and energy efficient. Many thanks to Cornell Tech and all of my colleagues in government and on Roosevelt Island that helped to complete this special project,” said New York State Senator José M. Serrano. “This milestone is a game-changer – and this campus is a New York City gem. As it prepares students for jobs of the future today, Cornell Tech will keep our city competitive in emerging industries tomorrow. This transformative project truly cements New York City as a global tech hub, and it illustrates what happens when government, academia, and industry all work together. Every stakeholder in this project should be exceptionally proud,” said Comptroller Scott M. Stringer. “As our world becomes more tech-centered, the Cornell Tech campus will allow New York City to be at the heart of the innovation, leadership — and most importantly, jobs — in this space. This campus will bring academics, research and business together and educate the bright minds of our future. I look forward to seeing all that Cornell Tech has to offer our City, and to working with Cornell Tech to ensure that New Yorkers from every corner of our City benefit from this world-class institution,” said Public Advocate Letitia James. Cornell Tech started up in a temporary space generously provided by Google and has already graduated more than 300 masters and doctoral students, with most entering the New York City tech sector after graduation by joining local companies or starting their own. Masters students across all programs — computer science, law, business, electrical engineering, operations research, connective media and health tech — spend time learning and working collaboratively together in a Studio curriculum with extensive engagement with the tech industry. The projects students pursue in the Studio encourage them to practice entrepreneurship, product design, tech and public policy, management and other skills, helping them graduate with tangible, marketable experience and a portfolio of completed work that will help launch their career. Cornell Tech’s 30-member faculty has launched cutting-edge research groups in the areas of Human-Computer Interaction and Social Computing, Security and Privacy, Artificial Intelligence, Data and Modeling, and Business, Law and Policy. All of the faculty have a focus on applied research and having a real world impact. “We are entering a new era for tech in New York, and the Cornell Tech campus is at the heart of it. Cornell Tech was given the rare opportunity to create a campus and academic program from scratch. The opening of our new campus brings together academic disciplines critical to the digital transformation of society and the economy, together with companies, early stage investors, and government to spark innovation and help improve the lives of people throughout the City, country and world,” said Cornell Tech Dean Daniel Huttenlocher. The Jacobs Technion-Cornell Institute at Cornell Tech is a unique academic partnership of two leading global universities, the Technion Israel Institute of Technology and Cornell. The Institute houses the Health Tech and Connective Media programs, where students receive dual degrees from Cornell and the Technion, and the Jacobs Runway Startup Postdoc program for recent tech PhDs.The Runway program has been responsible for about half of the more than 30 companies that have spun out of the Cornell Tech campus with more than $20 million in funds raised and employing more than 100 people. “The Jacobs Technion-Cornell Institute is a cornerstone of Cornell Tech, combining Cornell’s commitment to discovery with Technion’s global leadership in applied research and entrepreneurship. From our dual masters degree programs, to our groundbreaking faculty research, to the innovative companies spinning out of the Jacobs Runway Startup Postdoc program, our partnership and impact will grow on our new campus. Through the Jacobs Institute, Cornell Tech and New York City as a whole will always be on the leading edge, experimenting with novel ways to educate, discover, and innovate,” said Ron Brachman, Director of the Jacobs Technion-Cornell Institute. “By steering students through Cornell Tech, and its soon-to-come Verizon Executive Education Center, we can build students and business people into lifelong learners and inspire them to be more innovative and impactful leaders. Our investment in Cornell Tech, is a testament of our belief that technology can be a transforming force in our society. This unique institution will be a model for the future and a shining example of how to solve big challenges and make people’s lives better,” said Lowell McAdam, Chairman and CEO of Verizon. “Even without a permanent campus, Cornell Tech has already established a proven track record of developing innovative companies and top tier talent here in New York City. Now in its beautiful new home on Roosevelt Island, Cornell Tech immediately establishes itself as one of New York’s premier tech institutions—helping us attract and retain the technical talent and companies our industry needs to grow and thrive,” said Julie Samuels, Executive Director of Tech:NYC. 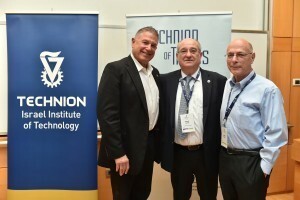 From left to right: Chairman of the Board of Governors Lawrence (Larry) Jackier, Technion President Prof. Peretz Lavie, and Chairman of the Technion Council Gideon Frank. No image credit. In recent years, Technion has indeed been working on many fronts towards this purpose, and the two flagships are its extensions in New York and China, which will be inaugurated this year: the permanent campus of the Jacobs Technion-Cornell Institute (JTCI) for applied engineering-scientific research will be inaugurated in the heart of Manhattan in September 2017, and Guangdong Technion Israel Institute of Technology (GTIIT), near the city of Shantou in China, will be inaugurated in December 2017. 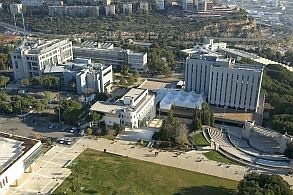 Technion is also strengthening its international reputation through strategic cooperation with leading universities around the world. The International School at Technion, which welcomes students from a variety of countries, has significantly expanded its activities and grown from 39 students in 2009 to 700 in 2016. Prof. Lavie said that these international projects place Technion at the forefront of global research and constitute an important milestone in its progress towards achieving the Technion vision: “Becoming one of the world’s ten leading scientific-technological research universities in the development of human capital, leadership, and knowledge, which works to advance the State of Israel and humanity.” He also noted the success of the MOOC (Massive Open Online Course) masterminded by Prof. Hossam Haick of the Wolfson Faculty of Chemical Engineering at the Technion: an online course in Arabic and English, which has already brought Technion to around 118,000 men and women from 87 countries, 23 of them in the Middle East.